This page is dedicated to species described from or found in Surrey for the first time in GB. The first British material of this distinctive coelomycetous fungus was made in Surrey in June, collected on attached dead twigs of a fastigiate hornbeam (Carpinus betulus ‘Fastigiata’) at Hurst Meadows, East Molesey. 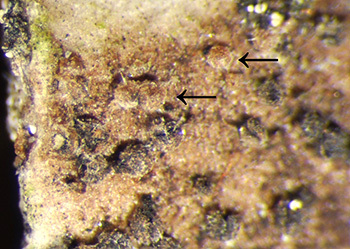 The pycnidial fruitbodies, scarcely more than 0.5 mm diam., are immersed within the bark and hence inconspicuous, visible only from their slightly protruding ostiole. The conidia, however, are unmistakeable. 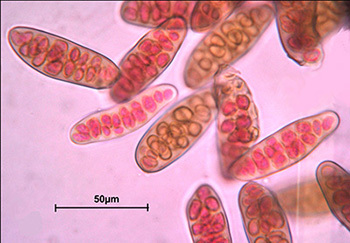 They are large, up to about 60 x 20 µm, pale brown when mature, and muriform, having a complex arrangement of thick-walled longitudinal and transverse septa (distoseptate) developed in 3 planes. Surprisingly, the species has only recently been described, being first found on hornbeam twigs in the Botanical Garden of the Komarov Botanical Institute in St. Petersburg. Another fungus which is distinctive under the microscope but inconspicuous in the field. 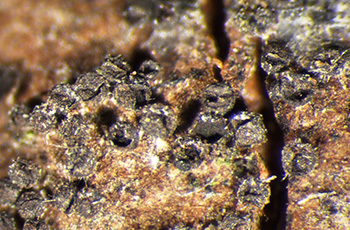 The small gregarious fruitbodies which develop under bark are subglobose, reddish-brown when young but becoming blackish, open by a split, with ephemeral asci leaving a mass of tiny, blackish spores. These are broadly ovate to subglobose, 6.5 – 8 x 5 – 6.5 µm, with a single, but conspicuous germ pore and mostly a de Bary bubble. Some thick-walled hairs occur on the surface. 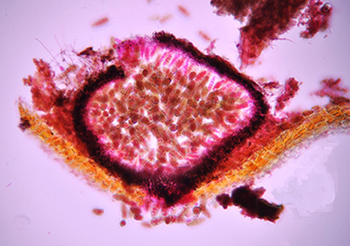 It seems close to C. heterotrichum, known from only from two collections from USA and Japan, but that appears to differ in having a crown of large, thick-walled setae around the ostiole. Found on a fallen branch of Magnolia grandiflora at Nonsuch Park in May. On the same branch were three other notable fungi: Diplodia magnoliae, only the second known record since 1935, a Diatrypella with 32-spored asci for which there is no obvious name, and Phanerochaete jose-ferreirae, new to England and only the third British record!